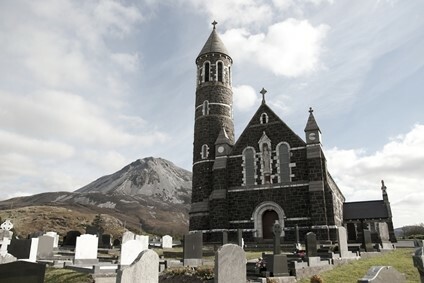 Dunlewey Church, below Errigal Mountains, Co Donegal. A vast number of records from Irish church registers from several denominations have become readily available to researchers online over the last six or so years. While the majority are accessible only to subscribers of online databases, some are free. Indexed and searchable by name, these record sets have helped countless family historians unlock the mysteries of their Irish heritage. But by no means are most parish registers online. A sizeable proportion can still be explored only by a personal visit to an archive. This page provides generic details of the main sources of Irish church registers. For information specific to each religious denomination, see the Quick Links/Related Pages box in the right-hand column. This page provides generic details of the main sources of Irish church registers. For information specific to each religious denomination, see the Quick Links/Related Pages box below. The huge online database of RootsIreland.ie is run by the Irish Family History Federation (IFHF) and contains some 20 million transcribed records of births, marriages and deaths. Not all of them are from church registers, however. Some are from civil registration records. It's also important to note that the City of Dublin, some parts of County Cork, and all parts of Counties Kerry do not feature on this site (see IrishGenealogy, below). Having been through a number of expensive pay-to-view credit and purchase models, the site has more recently introduced monthly and even day subscriptions. This seems to have been well received by most researchers, especially those who are at the earlier stages of their research. While you'll be keen to start searching the database the minute you arrive on this site, PLEASE take a few minutes to familiarise yourself with a few features. If you rush headlong in, you may end up incredibly frustrated. 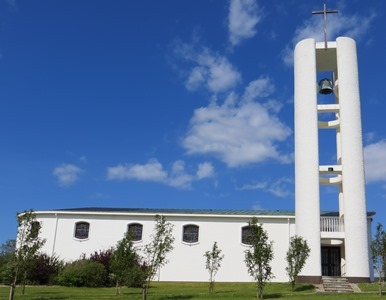 Check that the site holds baptism, marriage or burial records for the parish and religion you want to search. Just because the site says it holds records for a particular county, you shouldn't expect that it holds ALL records for that county. Coverage can be surprisingly patchy over a spread of years and for different religions. You can see precisely which records are held by using this widget and entering the name of the county you are interested in. The church records held on the site are transcriptions. Where it holds records from registers imaged on the free NLI site, it links to the image. But note that RootsIreland has some records that are additional to those on the NLI site; in these cases it does not link to any images. For all other religions, RootsIreland's records are transcriptions only. If you find a pre-1881 Roman Catholic transcription of interest, you should be able to locate and view an image of the entry on the free National Library of Ireland's website. There's more about this on the Irish Catholic parish registers page. Be aware that the site holds more than just Irish church register transcriptions, and some of these other records may be available free elsewhere. The 1901 & 1911 Irish Census returns are a case in point. Free to search and view, the site holds transcriptions of the surviving register entries (most stop before 1900) and, in many cases, links to images of the relevant register entry. This is a truly marvellous additional genealogy resource that's sure to help you unravel your Irish family history if your ancestors came from the areas it covers. It's easy to use, too. The National Library of Ireland's collection of microfilms of Roman Catholic Registers has been digitised and made available as an unindexed, image-only database on a dedicated area of the Library's website. More about this important resource. Family Search, the vast genealogy website run by the Church of Latter Day Saints (LDS), holds three collections that will be useful when trying to trace your family's history in Ireland. In addition to a number of births and marriages and just a few deaths transcribed from Ireland's civil registration records, these collection hold many births, marriages and deaths submitted by LDS members from unidentified records (which must not be relied upon). Well, yes, to some extent. The main trouble with the LDS record collections it is that coverage - geographical as well as date - isn't very even. So while you can find, for example, several thousand Church of Ireland baptisms from 1683 to the late-1800s for Clones in Co. Monaghan, as well as the full baptism and marriage records from 1782 to 1870 from the Presbyterian parish of Boardmills, Co. Down, and just over 40 baptisms from the Methodist registers of Dundalk, Co. Louth, you won't find any entries from Roman Catholic registers for any of these places. In fact, the coverage of Catholic church records is limited to just a selection of parishes in counties Cork, Galway, Kerry, Roscommon and Sligo. It is, therefore, a bit of a miss-mash. Spelling errors abound, especially of place names, and it is far from complete. Some registers were fully transcribed. Others were partially transcribed. Some were not transcribed at all. It is very hit and miss. Well, yes, to some extent. The main trouble with the LDS collection it is that coverage - both geographical and date - isn't very even. In fact, the coverage of Catholic church records is limited to just some parishes in counties Cork, Galway, Kerry, Roscommon and Sligo. Their greatest asset, however, is the sizeable collection of entries transcribed from Irish church registers. Overall, the offer is strongest on baptisms; it has a smaller proportion of marriages and hardly any burials. 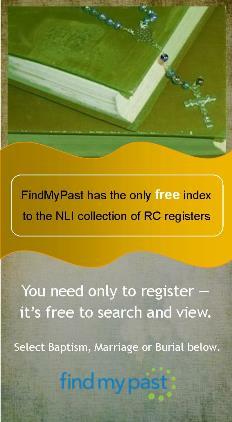 For all that, it was, until early 2009 (when it formed part of what was known as the International Genealogical Index (IGI)), pretty much the only free online resource with even vaguely national coverage to help people trace family history in Ireland, and it still earns its place in your ancestral search. I'm extremely grateful to the LDS for it. The source documents ie the parish registers of Irish church records held in this collection can be viewed on microfiche or microfilm through the LDS Family History Center network for a small fee. You simply order the film or fiche containing the images of the register you are interested in. You can get further details of how to do this by contacting one of the Centers. Top Tip for using this collection: Regard each discovery as an important clue worth following up. Don't rely on any record you find. Verify everything. Many, but not all, churches and congregations hold a copy or transcript of their historical parish registers. All will hold more recent registers. How far back in time these registers go may vary significantly from one parish to another. Also highly variable will be the access offered by the local priest, minister or vicar. 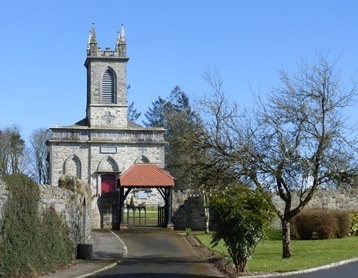 When I started to trace my family history back in 2002, I was spoiled by my experience at St Andrews, the Catholic church in Bagenalstown, County Carlow. Without any appointment or charge, I was allowed to turn up and study their neatly filed and typed printouts of transcribed baptism, marriage and burial records. Had I contacted the church by letter or phone, the vestry staff would have offered to do the research for me for a modest fee. I was mightily impressed. I thought this was how it was always going to be, and innocently expected I'd get all my ancestors lined up in a family tree chart in no time at all. 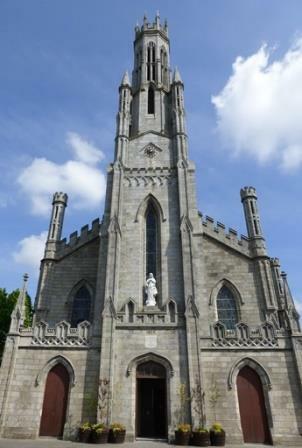 Cathedral of the Assumption, Carlow. In Cork (I won't mention the name of the parish), the reception was very different. When I rang to make an appointment, I was told there were no printouts, and registers were not available for the public to view. However, if I wanted to make a donation to the church, the priest would see if he could find the records I was seeking. I sent a 'donation'. I didn't hear another thing. Only later did I discover that these parish registers were available on microfilm at the National Library in Dublin, so I didn't need to see the parish originals. And I wouldn't have to pay or make any donation, either. I've since learned that I'm not the only researcher to have made a 'donation' and received nothing. However, I've also learned that many researchers have received records following their 'donations'. I guess it depends on the parish. If you are at a distance, you might try approaching the parish church itself to see what arrangements, if any, they could make to help you trace family history in their parish. You should be able to find details of individual churches on Google. For additional research information about each of the the main religious groups in Ireland, see the Quick Links/Related Pages box in the right-hand column. For additional research information about the main religious groups in Ireland, see the Quick Links/Related Pages box below. 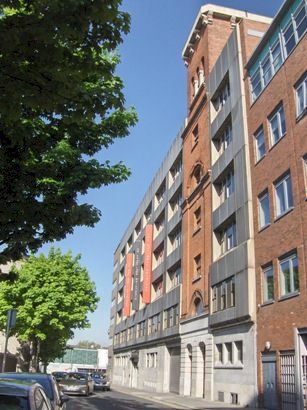 Ireland's network of Heritage Centres – typically one per county – has been involved in the transcription and computerisation of Irish church registers for some years. Most of these centres are part of the Irish Family History Foundation and release their records online through that organisation's umbrella website, RootsIreland (see above). All of these centres, and also those who do not release their records through the IFHF, can be commissioned to carry out family history research. They do not allow personal visitors to access their records. In other words, you can choose to either access their records via RootsIreland or to commission the heritage centre team to conduct research. Unfortunately, some Heritage Centres have closed in recent years ie South and West Cork. In these areas, you might like to consider hiring a local professional genealogist. Of course, hiring a professional is always an alternative to doing it yourself. They have the specialised skills to help you, whether you want a full genealogy drawn up or just need a little direction over a particular brickwall. To find one, you can make contact with members of Accredited Genealogists Ireland (AGI), choose one from the National Library of Ireland's list, or follow recommendations from fellow family historians. The National Archives of Ireland (NAI), the Public Record Office of Northern Ireland (PRONI) and the Church of Ireland's Representative Church Body Library (RCBL) have, between them, extensive offline collections of Irish church registers. Personal visits to each of these repositories is free of charge but you may need an appointment or Reader's Card before you can use the Reading Rooms. Check the access arrangements before visiting. The National Library of Ireland's microfilmed collection of Roman Catholic parish registers is now available on a free online database. The microfilms themselves are no longer available to personal visitors. Both the National Archives of Ireland and the National Library of Ireland offer year-round free Genealogy Services to personal visitors on a first-come, first-served basis ie no appointments. Details are on each of the websites. The 'Head Offices' of each of the main religious groups may also be able to help you. For more specific research information on each of the main religious groups in Ireland, see the Quick Links/Related Pages box in the right-hand column. For more specific research information on each of the main religious groups in Ireland, see the Quick Links/Related Pages box below. There are a growing number of city, county and regional websites containing transcripts of various baptism, marriage and burial registers, as well as gravestones. Some of these are pay-per-view or subscription sites such as AncestryIreland and Emerald Ancestors in Northern Ireland. Others, for example IGP Archives and From-Ireland, are free. A good many books have also been published over the years containing gravestone transcriptions from old churchyards. The best way to come across these is to search on Google or PERSI (Periodical Source Index). The best way to locate the latter is to search on Google or PERSI (Periodical Source Index). Irish Genealogy News is the blog that runs in tandem with Irish Genealogy Toolkit. Slane Friary on the Hill of Slane, Co Meath, one of Ireland's most important ecclesiastical sites. Hiring a professional is always an alternative to doing it yourself. They have the specialised skills to help you, whether you want a full genealogy drawn up or just need a little direction over a particular brickwall. To find one, you can make contact with members of Accredited Genealogists Ireland, choose a researcher from the National Archives of Ireland's list, or follow recommendations from fellow family historians.